Fully referenced and supported by a cohesive organization and full-color format, Goldfrank’s begins with a historical perspective on medical toxicology principles and the general approach to the patient. It then progresses to the fundamental principles of medical toxicology, encompassing biochemical and molecular concepts; the effect of xenobiotics on vital organs and body systems; and toxicologic principles in special populations. 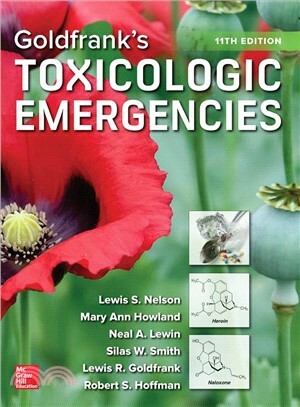 The Eleventh Edition of Goldfrank’s Toxicologic Emergencies is the most rigorous volume to date, driven by a precise analysis of the latest medical literature and complex cases designed to facilitate differential diagnosis. Lewis S. Nelson, MD is Professor and Chair, Department of Emergence Medicine, Rutgers New Jersey Medical School, Chief of Service, Emergency Department, University Hospital. Robert S. Hoffman, MD is Professor of Emergency Medicine and Medicine, Director, Division of Medical Toxicology, New York University School of Medicine, Attending Physician, Emergency Medicine, Bellevue Hospital Center and New York University Langone Medical Center, Consultant, New York City Poison Center. Mary Ann Howland, PharmD is Clinical Professor of Pharmacy, St. John’s University College of Pharmacy and Health Sciences, Adjunct Professor of Emergency Medicine, New York University School of Medicine, Bellevue Hospital Center and New York University Langone Medical Center, Senior Consultant, New York City Poison Center. Neal A. Lewin, MD is Druckenmiller Professor of Emergency Medicine and Professor of Medicine (Pharmacology), New York University School of Medicine, Director, Didactic Education, Emergency Medicine Residency, Attending Physician, Emergency Medicine and Internal Medicine, Bellevue Hospital Center and New York University Langone Medical Center, Consultant, New York City Poison Center. Silas W. Smith, MD is Associate Professor of Emergency Medicine, Chief of Safety and Quality, Department of Emergency Medicine, Associate Director of Medical Toxicology Fellowship Program, New York University School of Medicine, New York City Poison Control Center, Attending Physician Bellevue Hospital Center and New York University Langone Medical Center. Lewis R. Goldfrank, MD is the Herbert W. Adams Professor of Emergency Medicine, Ronald O. Perelman Department of Emergency Medicine, Director, Emergency Medicine, Bellevue Hospital Center and New York University Medical Center, Medical Director, New York City Poison Center.